A leading London artist was shot dead as he tackled robbers who burst into his first wedding anniversary party. Clinton De Menezes, 43, bundled his wife Nicola Saward and their daughter Eva, seven, into a bathroom when the robbers forced open a door. He was shot in the chest when he went to the aid of a friend who was trying to fend off one of the gunmen with a plastic chair. As Mr De Menezes lay dying his wife kissed him and then closed his eyes. A friend said she thanked him for being a loving father and husband. The distraught girl also said a tearful goodbye. Clinton De Menezes was born in Johannesburg, South Africa in 1970. 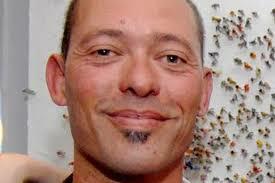 He achieved his Masters Degree in Fine Art from the Durban Institute of Technology in 2004. De Menezes has lectured in painting, drawing and history of art. He successfully co-founded The Art and Sculpture Studio, co-ordinating and facilitating drawing and painting workshops for adult learners. He was the curator of The Cupboard Gallery and on the exhibitions committee for Durban’s acclaimed Red Eye Art Collective. In 2004 De Menezes founded Alchemy Studios, a company established to fabricate artwork for private and public spaces. In 2007 he relocated to the United Kingdom to actively market Alchemy Studios and to pursue his career in Fine Art. In 2010 he was invited to install Procession (Exodus) in the contemporary galleries of the Metropolitan Museum of Art, New York, on long term loan. In 2011 he won the tender for a major commission for the new offices of PricewaterhouseCoopers designed by Norman Foster in More London. De Menezes has work in private and corporate collections internationally. This entry was posted in NEWS and tagged Clinton De Menezes. Bookmark the permalink.